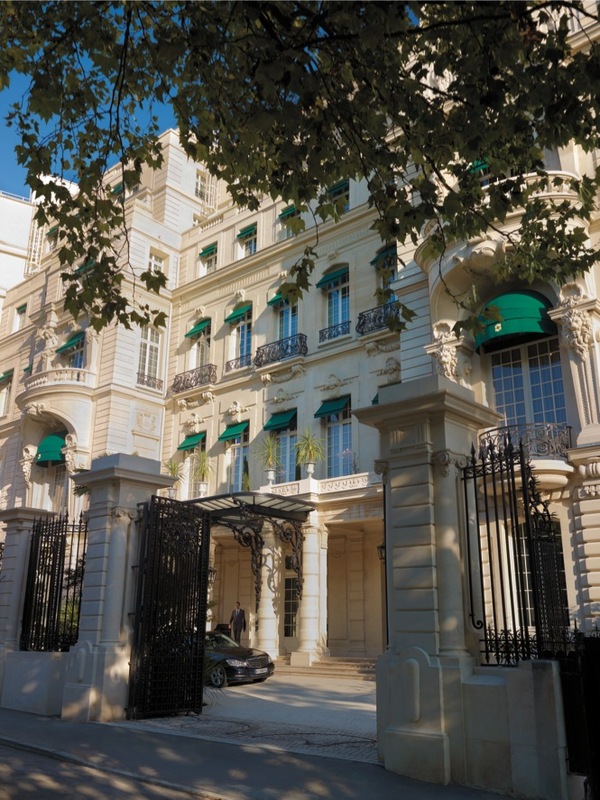 Outside Le Royal Monceau-Raffles, a historic property overhauled by Philippe Starck. The entrance to the Shangri-La Hotel Paris, whose building once served as the mansion of Napoleon Bonaparte’s grandnephew. Mandarin Oriental Paris’s Royal Mandarin suite. As a trio of Asian-born luxury hotel brands debuts in Paris, it looks like the faux chateau may finally be getting the heave-ho. Ever since the first boom in global tourism during the 19th century sent hordes of newly affluent Britons and Americans to the City of Light, Paris’s cream-of-the-crop accommodations—”palace” hotels in local parlance—have been peddling a carefully studied approximation of aristocratic French chateau style and hospitality to anyone who can swing their sky-high rates for a night. Think major Gallic gilt trips on tap at such opulent addresses as the Place Vendôme or the Place de la Concorde, where liveried doormen, lavish Louis-the-something furniture, and daunting doses of formality are the norm. 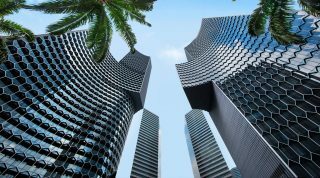 Now, these grande dames are getting their feathers ruffled as new Asian competitors arrive with the famously gracious service and deep-dish modern luxury that have made them the new benchmarks of the hotel industry in the 21st century. Five years in the making, the hotly anticipated Mandarin Oriental Paris opened its doors in June, and le tout Paris has been trooping across its vestibule’s fiber-optic-inlaid carpeting ever since to see the results. Occupying the shell of a 1925 Art Deco building on Rue du Faubourg St.-Honoré, the 138-room hotel is the work of esteemed French architect Jean-Michel Wilmotte, who retained the original facade but completely rebuilt the interiors around a central garden planted with magnolia and camellia trees (a stone fountain divides the courtyard between the outdoor serving areas of Bar 8 and Camélia, one of the hotel’s two restaurants). The luxury of a quiet breath of fresh air in the heart of the city has enthused Parisians almost as much as the hotel’s superb bar (sculpted from a nine-ton piece of Spanish marble) and its smiling and seamless service. The room decor, by French designer Sybille de Margerie, deploys reproductions of the famous Man Ray photograph The Kiss as headboards, but what’s really been impressing guests are amenities like built-in iPod plugs, Nespresso machines, Frette sheets and bath robes, complimentary sweets from chocolatier Fabrice Gillotte, and an exclusive new line of toiletries by famous Parisian perfumery Diptyque. 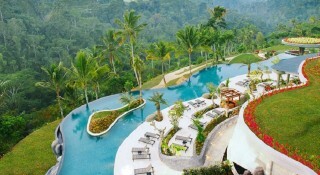 The hotel’s 900-square-meter spa, with a treatment menu that uses Guerlain and Aromatherapy Associates products, has been winning raves, too—though local food critics have had a more querulous response to the elaborate contemporary French cooking of chef Thierry Marx at Sur Mesure, the hotel’s signature restaurant. 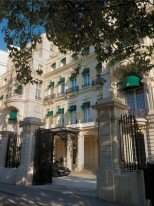 251 Rue du Faubourg St.-Honoré; 33-1/7098-7888; mandarinoriental.com; doubles from US$1,200. 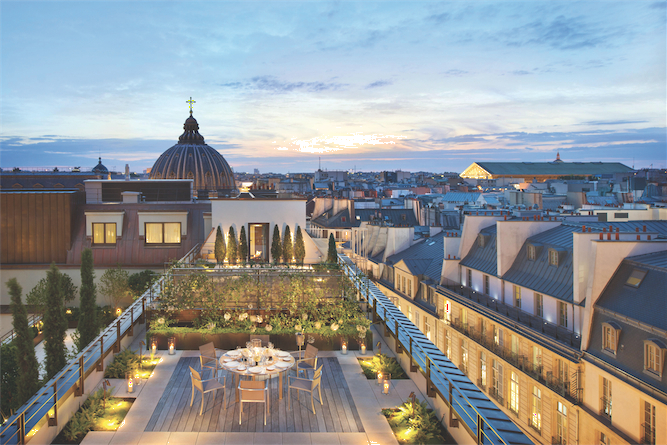 If Mandarin Oriental has boldly created a Paris hotel aimed more at emerging overseas (mostly Asian) markets than such traditionally Francophile markets as Europe and North America, Shangri-La chose to kneel at the altar of time-honored Gallic elegance. Opened late last year, the 81-room hotel inhabits a grand limestone mansion that was originally the home of Prince Roland Bonap-arte, Napoleon’s grandnephew. 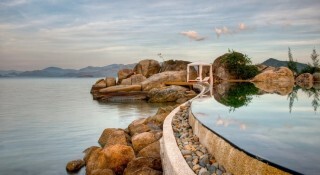 But can a Hong Kong–based hotel group beat the French at their own game? Perhaps. Shangri-La spent a fortune renovating the place, which is perched on a hillside in the sedate 16th arrondissement with stunning views over the Seine and the Eiffel Tower. Public spaces are awash in ormolu and lavish moldings, the staff are all pomp and circumstance, and guest rooms are Franco-Asian chic with lots of celadon, powder-blue, and taupe silks. Still, there’s a distinctive Eastern stamp on this pedigreed French mold, from the high quality of in-room amenities to the food served at two of the hotel’s three restaurants. La Bauhinia offers curry laksa alongside classic French specialties, while the Shang Palace, with its Cantonese chefs, has created nothing short of a sensation in Paris, a city with only middling Asian fare despite France’s colonial connection. 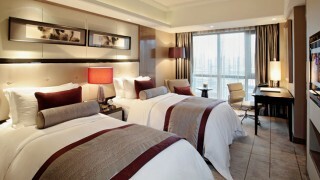 10 Ave. d’Iéna; 33-1/5367-1998; shangri-la.com; doubles from US$1,210. While high occupancies are the bull’s eye any hotel manager aims for, the true measure of success for a new Paris property is when it becomes a part of la vie Parisienne. 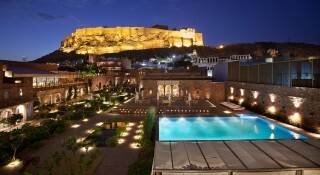 In these terms, this 149-room address is a runaway success. 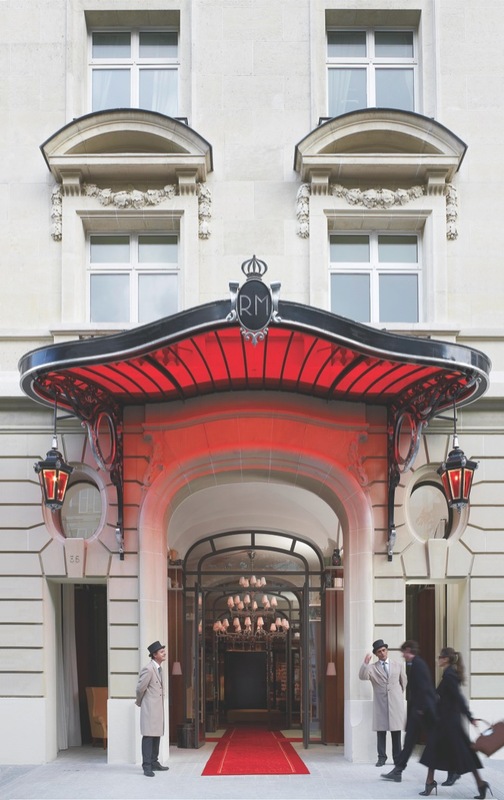 Since last year’s reopening of old Le Royal Monceau (built in 1928) under Raffles management, Parisians have been congregating for drinks in its lobby bar or dining in the dramatically designed La Cuisine or Il Carpaccio restaurants, because this place is something that luxury hotels in Paris almost never are—fun. Credit for that goes to the building’s two-year overhaul by Philippe Starck, who puckishly punctuated the original limestone facade with red-glass lanterns. 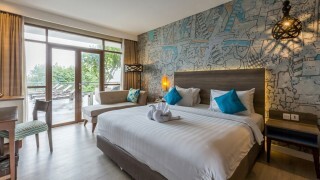 The same cheeky wit informs the thoughtfully designed guest rooms, which are appointed with ivory-leather headboards, framed modern art and photographs, televisions hidden behind large mirrors, and, curiously, acoustic guitars—there, perhaps, to burnish the hotel’s hipster credentials. Though the Clarins spa is about as French as they come, the service at Le Royal Monceau is friendly and kid-gloved —a refreshing change from the hauteur that’s native to most high-end Paris lodgings. 37 Ave. Hoche; 33-1/4299-8800; leroyalmonceau.com; doubles from US$1,058.